The Villiers Engineering Co. Ltd.
After the war demand continued to be very strong and the company was almost constantly expanding and re-organizing. 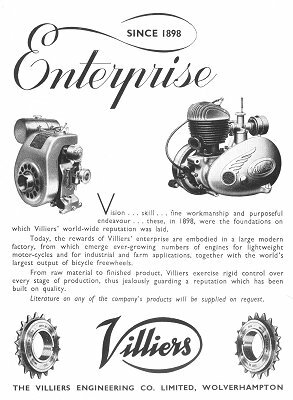 In 1956 Villiers produced its two millionth engine and duly presented it to the Science Museum. In 1957 they "absorbed" J. A. Prestwich Industries Ltd., makers of the J.A.P. engines. In 1962 the company were claiming that: "jointly the two companies produce a vast range of two-stroke and four-stroke petrol engines and four-stroke diesel engines from 1/3rd to 16 bhp. These are the engines which power many of Britain's two-stroke motor cycles, scooters and three wheelers and the great majority of the motor mowers, cultivators, concrete mixers, generating sets, elevators, pumping sets. etc." Not only that but the old standbys continued: "in fifty-eight years [Villiers] have sent nearly seventy millions [bicycle free wheels] to all parts of the world". Not only did the company produce engines but, as they said in 1962: "The Villiers Group offers an extensive service to industry in the supply of drop forgings, castings, pressings and metal fabrications, spur, bevel and helical gears, and in the design and manufacture of Viltool special-purpose machine tools, using the Viltool unit heads and the 'building block' system of tooling." 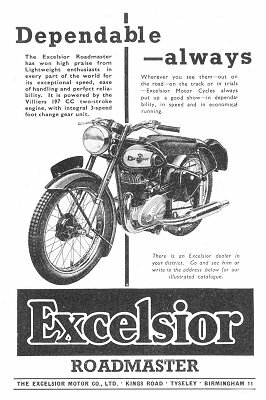 This 1951 Excelsior was fitted with a Villiers 197cc two stroke engine. Overseas the company had subsidiaries in Australia (Ballarat), New Zealand and Germany and associate companies in Spain and India. 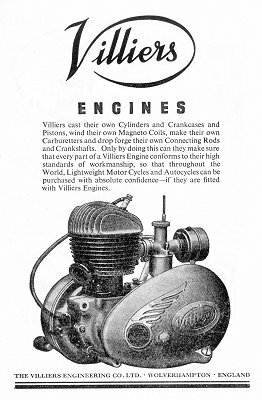 To give an impression of how widely used Villiers engines were here is a list, names only, of motorbikes which had Villiers engines in some or all of their models in the post World War II period alone: Aberdale, ABJ, AJS, AJW, Ambassador, BAC, Bond, Bown, Butler, Commander, Corgi, Cotton, Cyc-Auto, DMW, Dot, Excelsior, Francis-Burnett, Greeves, HJH, James, Mercury, New Hudson, Norman, OEC, Panther, Radco, Rainbow, Scorpion, Sprite, Sun, Tandon. In the early 1960's the company was taken over by Manganese Bronze Holdings, who also purchased Associated Motor Cycles (A.M.C.) in 1966. A.M.C. was formed in 1931 when A.J.S. was purchased by Matchless. In 1952 A.M.C. acquired Norton Motors Limited who produced Norton motorcycles. After A.M.C. 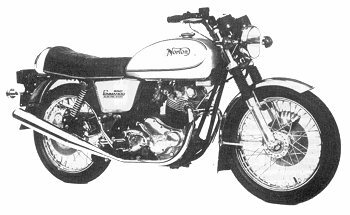 's collapse and take-over in 1966, a new company called Norton Villiers was formed, which would produce machines using the Norton name. A new flagship machine was needed to replace the current ageing models, and so in 1967 the Commando was developed, just in time for the Earls Court Show. The first production machines were completed in April 1968, but there were bending problems with the frame and so a new frame was developed, and introduced in January 1969. The original model, now called the 'Fastback' was joined by the 'S Type' which had a high level left-side exhaust and a 2.5 gallon petrol tank. Initially the engines were produced in Wolverhampton, the frames in Manchester and the components were assembled at Burrage Grove, Plumstead. The Plumstead works were subject to a Greater London Council compulsory purchase order, late in 1968 and closed in the following July. After a Government subsidy, an assembly line was set up in a factory at North Way, Andover, with the Test Department in an aircraft hanger on nearby Thruxton Airfield. Manufacturing also took place in Wolverhampton, where about 80 complete machines were produced each week. Components and complete engines and gearboxes were also shipped overnight, from Wolverhampton to the Andover assembly line. 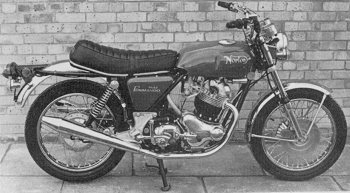 The police were showing a lot of interest in the Commando and so Neale Shilton was recruited from Triumph to produce a Commando to police specifications. The end result was the 'Interpol' machine, which sold in good numbers to police forces, both at home and abroad. The machine was powered by a 750 c.c. O.H.V. engine and included panniers, top box, fairing, and had fittings for a radio and auxiliary equipment. Right from the beginning the Commando took part in racing events, and after its win in the 1969 Hutchinson 100 and a second place in the Production T.T., the company decided to produce a racing model. This led to the development of the successful 750 c.c. overhead valve 'Production Racer'. It featured a tuned engine, front disk brake and was finished in bright yellow, which led to the machine being known as the 'Yellow Peril'. The Norton Interstate. Courtesy of the late Jim Boulton. A new version of the 'S Type' was introduced in March 1970, called the 'Roadster'. It had a 750 c.c. O.H.V. engine and a low-level exhaust, with upward angled silencers and reverse cones. The model 'S' was discontinued in June. September 1970 saw the introduction of the 'Fastback MK. 2', which was soon replaced by the Mk.3. It had alloy levers and modified stands and chain guards. The ‘Street Scrambler’ and the ‘Hi Rider’ were launched in May 1971 and the ‘Fastback Long Range’ with a larger petrol tank, was launched in July. January 1972 saw the appearance of the ‘Mk.4 Fastback’, an updated ‘Roadster’ and the ‘750 Interstate’, with its high performance ‘Combat’ engine. The ‘Combat’ could deliver 65 b.h.p. at 6500 r.p.m. with a 10 to 1 compression ratio. Unfortunately the engine proved to be extremely unreliable, main bearing failures were common and pistons tended to break off at a slot, under the oil control ring. These problems gave the company a bad reputation, which wasn’t helped by the fact that the ‘Commando’ suffered from quality control problems which were well covered in the motorcycling press. By the middle of 1972 the BSA-Triumph group were in serious financial trouble and the Government decided to bail the company out with a financial rescue package, providing it would agree to merge with Norton Villiers. This led to the formation of Norton Villiers Triumph Manufacturing Limited, but the new company got off to a shaky start. In January 1973 the ‘Mk.5 Fastback’ was launched and the ‘Long Range’ discontinued. In April the ‘Roadster’, ‘Hi Rider’ and the ‘Interstate’ all began to use a new 828 c.c. engine. Development work also began on a 500 c.c. twin, stepped piston engine, with a monocoque pressed steel frame. The new engine, called the ‘Wulf’, was dropped in favour of developing the rotary Wankel type engine that had been inherited from BSA. Things went well that year for the Norton racing team. Peter Williams won the 1973 Formula 750 T.T. and Mick Grant came in second. Unfortunately the company itself was in deep financial trouble and redundancy notices were issued at Andover, which was followed by a sit-in at the works. The situation continued to deteriorate in 1974 and came to a head in June when the Government withdrew its subsidy. The 750 Commando. Courtesy of the late Jim Boulton. There was a general election and luckily the incoming Labour Government restored the subsidy. The company decided to close two of its sites and concentrate production at Wolverhampton and Small Heath. This caused a lot of industrial unrest at Meriden, and resulted in a workers’ sit in, which stopped production at Small Heath. By the end of the year the company had lost over 3 million pounds. Even during these hard times the company still managed to produce new models. 1974 saw the release of the ‘828 Roadster’, the ‘Mk.2 Hi Rider’, the ‘JPN Replica’ and the ‘Mk.2a Interstate’. Only two of these were to continue in production the following year. Early in 1975 the company reduced its range of models to just two machines, the ‘Mk.3 Interstate’ and the ‘Roadster’. Both machines were improved by the fitting of an electric starter, a left side gear change, right foot brake and rear disk brake. Things went from bad to worse in July when the Industry Minister recalled a loan for 4 million pounds and refused to renew the company’s export credits. The company then went into receivership and redundancies were announced for all of the staff at the various sites. At Wolverhampton an action committee was formed in an effort to continue production and develop the ‘Wulf’ engine. The works were picketed and a prototype machine called the ‘Norton 76’ was produced. This came to nothing as the Wolverhampton works never reopened. It was a sad end to such an important company, and a bitter one. Many of the local workers never received the money that was owed to them. Norton Villiers Triumph managed to survive when the Government stepped in to save part of the company, but unfortunately this did not include the Wolverhampton factory. The British motor cycle industry was in its death throes. The market for British machines disappeared, there was not enough demand to maintain the factory. With a strange burst of enthusiasm the company bought the gates from the now demolished Tong Castle and erected them at the works entrance in Marston Road. It was a last gesture.